Lasvit’s Neverending Glory collection, designed by Jan Plechác and Henry Wielgus. Pictured from left, Neverending Glory Prague Estates Theatre, Palais Garnier, La Scala, Metropolitan Opera, and Bolshoi Theatre. For a glimpse into the future of design, head to Milan’s Magenta neighborhood in mid-April. There, in the leafy courtyard of a former tie factory, Spazio Rossana Orlandi dazzles crowds in town for the annual furniture fair with exhibitions that feature everything from student designs to the latest work by established names. 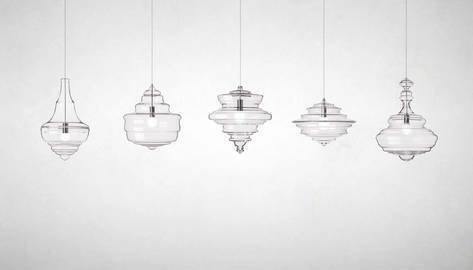 Much of the buzz this year surrounded “Neverending Glory,” a collection of hand-blown glass chandeliers by Czech duo Jan Plechác and Henry Wielgus for Prague-based Lasvit. That one of the five works, a rippled feat of symmetry that resembles a giant toy top, emerged as the clear favorite came as no surprise to the designers, as they had based it on the famous chandelier at nearby La Scala. “This project began with the inspiration of iconic chandeliers,” says Plechác, who met Wielgus during their studies at the Academy of Art, Architecture, and Design in Prague, and formed a studio with him last year. “Then we narrowed it down to five chandeliers from five major opera houses around the world, from Moscow to New York.” In addition to the ornate fixture of the Bolshoi Theatre and the Metropolitan Opera’s midcentury swirl, they settled on the chandeliers of the Palais Garnier in Paris, La Scala, and a hometown favorite, the Estates Theatre in Prague. 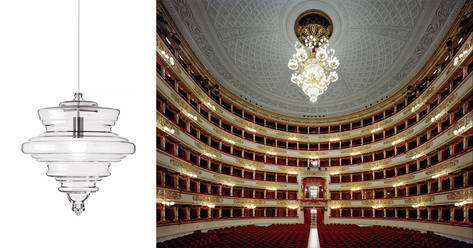 A crowd favorite at this year’s Milan Design Week, Neverending Glory La Scala was inspired by the famed opera house’s central chandelier, shown here in a photograph by David Leventi. 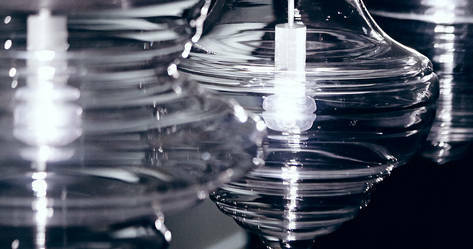 In addition to clear glass, the Neverending Glory collection is available in opaque white and smoked glass. 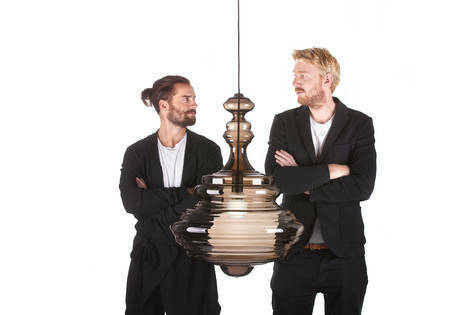 “I have different favorites in each of the three options,” says Plechác, pictured at left with partner Henry Wielgus and the chandelier inspired by the Bolshoi Theatre. Morgan Wendelborn, creative director and co-founder of The Line, discovered a photo of Neverending Glory Prague Estates Theatre shortly after the collection debuted in Milan. 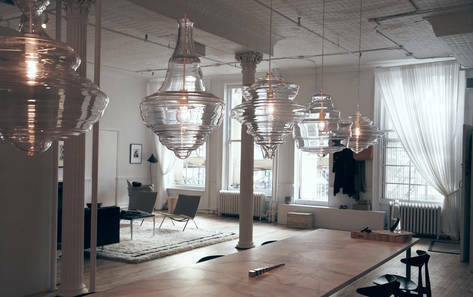 Now all five chandeliers have made the journey from mood board to The Apartment by The Line, where they hang over the marble dining table.